The “Sun City” of Lienz is a city with an Italian flair and offers adventures for all ages. With over 2.000 hours of sunshine in a year, Lienz draws people from far and wide both in summer an winter. Among its many attractions are the beautiful undisturbed natural wonders, the opportunities for rest and relaxation and unlimited hiking and biking routes as well as myriad sport and leisure activities. There is something for everyone. Anyone planning a holiday in Osttirol needs to add a tandem paragliding flight to their to-do-list. Osttirol is a true El Dorado for paragliding and tandemflights as well as gliders and hanggliders. This stunning flight region is a must for all these interested in various forms of gliding. Both the pilots and their guests have a once in a lifetime view of the majestic peaks of the Lienz Dolomites and the surrounding mountains. There are many flights to choose from in the Isel and Puster valley as well as the Gail, Drau, und Möll valleys. Your adventure starts in the most beautiful destination in Osttirol. One of the most requesting starting places to tandem paragliding in Lienz is Steiner Mandl at a height of 2.200 m above sea level. It is a very comfortable ride in a gondola and a chairlift (Lienzer Bergbahnen) to the Lienz Zettersfeld, also known as the “Sun Deck of the Alps”. From your starting place in Zettersfeld, you already have a fantastic view of the surrounding mountains as well as the Lienz Dolomites. This view can only be surpassed by the one you have on your paraglide. After your very detailed demonstration from Manfred, your pilot, and a few small steps, you are on your way to your adventure. Let yourself enjoy the feeling of total freedom! All of your cares are left behind as you soar through the air with the wind in your face. A feeling of total energy and the joy of life surround you. What a feeling! As an added bonus you will experience the beauty of the mountains, especially the highest mountains, the Großglockner and the Großvenediger. 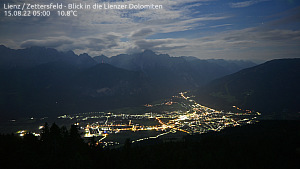 You feel as if you could almost touch the peaks at the Lienzer Dolomites as the city of Lienz lies at your feet. You need to live for pure enjoyment and let go of all other thoughts. Live in the “now”. After your soft landing in the valley, your first taste of paragliding can lead you to book another tandem flight. Perhaps you need more, so you can sign up for a course in paragliding at the Lienz Flight School.